Taylor Robinson Music’s “One-Click Webcam Classroom" is the first ever, cloud-based webcam platform made specifically for music lessons. The tool combines the highest quality HD video and crystal clear audio to create a seamless collaboration between music students and teachers. In addition, the Webcam Classroom provides voice translation and a suite of innovative music lesson tools. 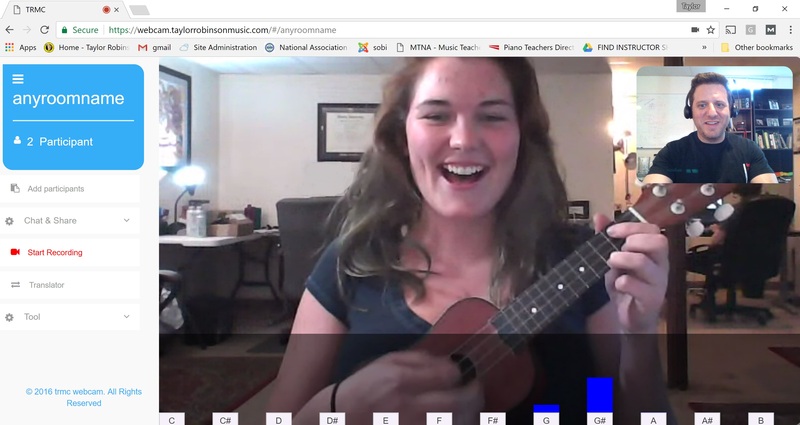 With the One-Click Webcam Classroom, music students and teachers can connect together for music lessons anywhere in the world. We’re extremely honored to have been recently nominated by the NAMM foundation as a nominee for the 33rd annual NAMM Technical Excellence & Creativity (TEC) Awards. This is a major achievement for us, and we’re so thankful for your support. Our platform is 100% web based. No software downloads required. Using your Google Chrome browser, enter the Virtual classroom and allow the app to turn on your webcam. You’ll be making music in seconds. It’s that easy. For musicians, high quality audio is absolutely essential. Taylor Robinson’s One-Click Webcam Classroom provides students and teachers with HD audio and video with near zero latency. See every smile and hear every chord. The One-Click Webcam Classroom integrates revolutionary music tools directly into the platform. Take your music lesson to the next level with Graphic Voice Pitch Detector, Interactive Instrument Tuner, Chord Library, Scale Generators, Adjustable Metronome, multiple camera angles and more! The worlds FIRST cloud-based webcam platform built specifically for music lessons! We've also included innovative tools like built-in graphic voice pitch detectors, digital instrument tuners, metronomes, chord chart and scale generators, file sharing, chat, and recording functions. We've even included a translator. This means that four users can all speak different languages yet hear and read the responses in their own. Best of all, it works right in your browser which means no software to download!